The theatrical sound track to raising our two daughters was ‘Beauty and the Beast’. The 1991 animated Disney film was the movie of choice on our VHS tape deck. When I close my eyes I see our daughters seated at their child size arts and crafts table painting and pasting, while Lumiere and Cogsworth playfully bicker from the screen. The sweetness of the movie features a strong, book reading heroine named Belle who saves the Beast from prison. A prison created by his own selfish spirit. Only if the Beast can learn to love and be freely loved in return can the spell of an enchantress be broken. Belle’s father, played by Kevin Kline is asked by his daughter to describe her mother, who died when Belle was an infant. Her father replies: ‘She was fearless. Absolutely fearless’. This is the attribute that Disney emphasizes for the heroine Belle. In like manner Belle is an independent heroine who defies the expectations of her village to conform. She is a fearless in rescuing her father from the Beast’s prison and ultimately her courage and compassion frees the Beast from a prison of his own making. This weekend my wife and I went to see the new Beauty and the Beast with our youngest daughter now 22. That same evening our eldest daughter age 25 went to see the film on the west coast with her friends. We all agreed we loved it. It was a pleasure to hear the familiar songs. 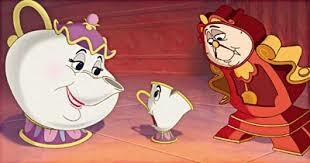 Angela Lansbury the Mrs. Potts that helped raise countless children, was replaced by the voice of Emma Thompson. Both actors brought the same kindness and protective mama vibe to their role. Adding to the experience 20 plus years later was seeing the intelligent, compassionate, fearless women that our daughters have become. Its comforting to know that Belle and Mrs. Potts whose story line and sound track were part of our daughters childhood, will continue to entertain and encourage a new generation to love books, to be fearless and kind.